I was told recently to expect to see a light green coming soon and I suspect it’s this same Ivivva color shown below called Mint Moment. 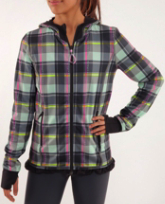 I also really love the new print that Ivivva has called Pretty Punk Plaid Black. I hope we see that print in the womens line but I doubt we will. Although we see a lot of the same colors on both Ivivva and Lululemon, we don’t get to share the prints. Some of you are lucky enough to be able to wear both brands, hopefully after a several months of Whole30 I can start looking at some of the tanks and tops too. "New! Cool Racerback in Laceoflage Print"
"Product Drop Monday: St. Moritz Jacket, Apres Chalet Items and More"